Prince, warrior, statesman, saint – Alexander Nevsky, whose memory we celebrate today, was all these things and more. Rather than going down in history as just another name in the history books, the veneration and love in which this thirteenth-century figure is held seem only to grow with time. Evidence of this can be seen in the results of the “Name of Russia” [Imia Rossiia] television contest in 2008, in which the public was asked to vote for the most notable personality in Russian history. The winner? St. Alexander Nevsky! To help explain this saint’s most recent victory, Elena Trifonova spoke with historian Artemy Ermakov. Why did a thirteenth-century prince win this contest? Alexander Nevsky, it would seem, is an ancient and therefore forgotten figure. Many people initially expected that the leading vote-getter would be someone like Peter the Great – but he did not even make the top three. Even Pushkin came in fourth. Part of the intelligentsia recoiled from the competition when the three finalists were announced: “Pushkin is our everything” they said, and here political figures have been chosen! But this serves to underline the popular character of the voting and the relevance of its results. Alexander Nevsky’s advocate in the “Name of Russia” project was Metropolitan Kirill, before his election as Patriarch. 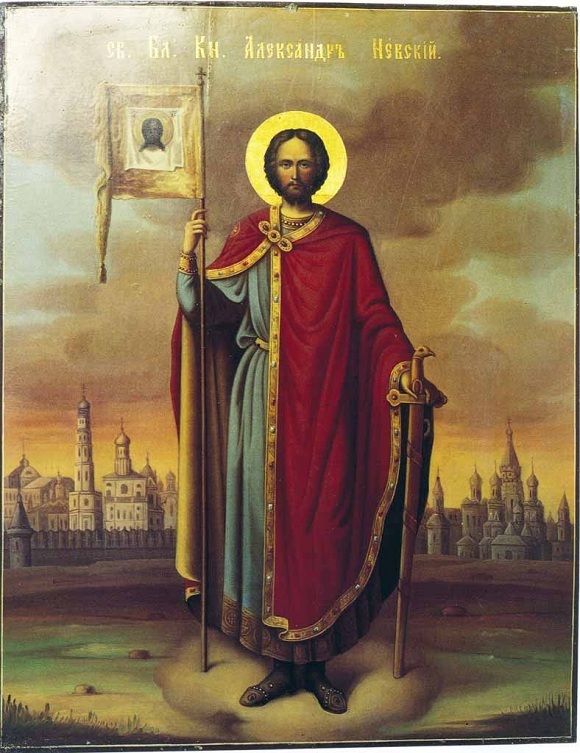 This was no accident, of course, because Alexander Nevsky was the only Russian saint among the final dozen candidates. Thus it turns out that, for the broad mass of people, Orthodoxy was represented not by a monk or bishop, but by a statesman. For the majority of people at the present time, the public role of Orthodoxy appears as the most relevant. After all, the original list had included Sergius of Radonezh, Seraphim of Sarov, and Andrei Rublev – all of whom, unfortunately “dropped out” rather quickly. It became clear that promoting Alexander Nevsky was not simply a question of promoting a state or political line, but the very possibility of an Orthodox option in state-building. One, moreover, that was not just formally Orthodox with the mandatory fast-keeping and church-going – and, incidentally, during his entire life of semi-nomadic wandering, Prince Alexander never missed a single Sunday service – but in spirit, one in which Christian ideals are reflected in a political leader’s conduct. What is the secret to Alexander Nevsky’s personality that has allowed him to become so firmly ingrained in the national consciousness and to be regarded across the centuries as an ideal leader by his people? There might be five or six such figures in the entire history of Russia. They are milestones. Sometimes, independent of their will, a new chapter in history begins with them. Being truly great compared to other people – who are no less outstanding, but who have not been as “lucky” in terms of historical periods – they are seen as having guessed the future long before it became clear to their contemporaries. On the other hand, this is something that they themselves created. One such figure in Russia is, above all, Prince Vladimir [c. 958-1015], who set the course of Russia’s transition from paganism to Christianity. This man, who had one foot in the past and the other in the future, continues to influence Russia to this day. The next happens to be Alexander Nevsky [1220-1263]. He defined Russia’s position between East and West – no final choice had been made before him. Moreover, Alexander’s choice was made in such a way that it initially seemed to be in favor of the East. But, in fact, it was during his time that Russia began to take shape as a distinct civilization, of a type that was neither Eastern nor Western. The next person of such stature is Ivan III [1440-1505], who transformed Moscow from a dependent principality into one that was pan-Russian and imperial. He transformed Moscow from a regional center into a world center. The next is Peter the Great [1672-1725]. While adapting Western forms of government, he in fact led the national resistance to Western influence – a very complex, and not ultimately successful, somersault. Nonetheless, for two centuries he defined the image of our country and the entire world. People continue to argue about who such a figure was in the twentieth century. But it seems that history allowed society to undergo another crisis, but without a leader who could unite rather than divide the nation. There is an aura of respect around such historical figures, regardless of whatever grievances some might have against them. People are inclined to forgive them a great deal. Thus Nevsky’s cooperation with the Golden Horde is overlooked. I think that what’s important to people is their identification with Prince Alexander’s desperate situation, in which he possessed minimal resources with a virtual absence of choice. As a matter of fact, political figures of that time had no real choices. As is the case today, the majority of them were simply afloat in a sea of events. Alexander was in the same position. His opportunities to influence the course of history were always minimal. There was nowhere to get people or money to move things along in his favor. Many people in such a situation would simply throw up their hands. The situation dictates that if you cannot be independent, then you should bet on whoever is strongest. It seems like your only choice is whose servant you want to be – that’s the entirety of your freedom. This is what happened with Prince Daniel of Galicia [1201-1264], Alexander’s contemporary. He united with the Catholic West. In tactical terms, he came off rather well and even defeated the Tartars several times, something that Alexander couldn’t even dream of. But soon after his death his principality turned into a third-rate province and ceased playing any kind of political role – it simply dissolved into Western civilization. Even ancient Russian churches and castles weren’t left standing, even though they could’ve been saved for purely pragmatic reasons. Moreover, the majority of these buildings were not destroyed by any kind of crusading invaders: the people themselves ruined or altered their ancestor’s sacred buildings to look more like those of their new masters. As a result, the Galician elite renounced both their faith and their language. The region of their former principality was divided between Poland and Hungary. And then when these countries were conquered in turn, it became a distant Austrian backwater. Today some people regret that Alexander didn’t negotiate with Europe. Europe was initially not very interested in hearing the opinions of the people of Novgorod and Pskov about their future. Do you want to stay in your cities? Then convert to Catholicism and learn Latin. Other Russians had to endure a century of being driven into the woods by Latvians, Estonians, and Finns – and they never would’ve left the woods if they hadn’t later become part of Russia. All that’s left of the Old Prussians is the word “Prussia.” Leipzig was once called Lipetsk, and Brandenburg was once Braniborsk. Where are their descendents today? That’s the magnitude of the problem that was resolved on the Neva River and Lake Peipus. And now we look down on the small scale of these clashes! Supposedly we’ve found something better to boast of: the Battle of Grunewald in 1410, the Battle of Rakovore in 1268, or even the Battle of Siauliai in 1236 between the Teutonic Knights and the Lithuanian princes – these battles were all of a much greater magnitude. But what’s important isn’t so much the scale as the results. True, Alexander didn’t defeat the main forces of Western expansion, but only the reconnaissance forces – but he defeated them in such a way that Sweden and the Teutonic Knights preferred for centuries to negotiate with Novgorod and Pskov, never again tempting fate – as was the case with Lithuania and Poland. Does it follow that Alexander Nevsky is a figure of social expectation? Choosing him means that people feel that they’re in roughly the same situation as Russia was under Alexander? Absolutely. A profound crisis and the inability to change the situation quickly – this is how conditions in Russia feel today. History, by the way, offers us another variation of conduct, represented by Andrei II of Vladimir [ca. 1222-1264], Nevsky’s brother, the “hero of resistance.” He couldn’t wait, so he gathered whatever small resources were available and did battle against the invaders. After suffering inevitable defeat, he fled to the West. There were also people who worshipped the Tartars, some even converting to their faith. But the chronicles haven’t preserved their names: this choice of conduct was more roundly condemned than any other. Why did one act one way, and another act another way? Here we see qualities that until quite recently were considered foundational for the Russian people: patience, the ability to wait, and persistence in achieving goals that, as a matter of principle, cannot be done tomorrow. Yet, all the same, continuing to work fitfully and stealthily. These qualities were lacking at that time; they were just beginning to come together. In fact, the Tartar yoke led to the formation of the national character. We think that the ability to use an enemy’s strengths against himself is the basic principle behind the martial arts – but this was in fact the basic principle behind Alexander Nevsky’s policies. It’s this principle behind the Russian people’s conduct that has helped it survive. Moreover, there is no outright deception here – that would be very quickly exposed and eliminated. One simply needs to know how to evade and how to wait. Here we are also touching on the basic Christian virtue of humility. But today that’s not just unpopular – it’s incomprehensible. Yet, all the while, there is the expectation of a leader who will teach humility in contemporary circumstances while manifesting it through his own personal example. It’s easy to call on your people to humble themselves before you: “You need to humble yourselves and endure, and I will seek my own at your expense.” Humbling oneself is difficult, but Prince Alexander knew how to do it. In the present case, humility means being able to accept one’s cross or one’s fate and then to choose life when it would be so much easier to give way to nonexistence. One has to choose one way or the other. Isn’t it paradoxical that Alexander Nevsky has become associated with Siberia? This is through his humility. He was one of the first people who personally sensed the Eurasian dimension of Russia’s future. He did not send anyone there, but went himself. And voluntarily, it’s worth adding. Yes, and it is precisely here, in captivity, that Alexander’s qualities as a great politician open up to us. He turns situations he’s in against his will into elements of his strategy. In fact, for him captivity became a sort of deep reconnaissance. Moreover, he didn’t go to Siberia alone, but with his brother Andrei. But his brother saw this as nothing more than captivity and humiliation. This voyage showed Alexander, on the one hand, the objective impossibility of armed resistance against the Tartar-Mongol state-military machine. At the same time, it was during this voyage that he worked out a long-term allied policy. Although without any rights, Alexander was able to attract so much respect from his enemies that they began to consider him a junior partner. This itself was already a minimal step towards independence. He seemed very lowly, but he was still one step above the floor. It was from precisely this step that his successors, the Muscovite princes, were able to carry out their partnership policy with the Golden Horde, which not only overturned the Horde step by step, but also allowed them the opportunity to claim their political legacy. Can we call Alexander a political analyst of the highest caliber? We might say that the Holy Spirit led him or, if it’s easier for someone, that he had extraordinary intuition. However, he could indeed sense the prospects for Russia’s development in the very direction that he took. The trajectory of his journey turned into the borders of the Russian Empire 600 or 700 years later. His vector of motion coincided with Russia’s vector of motion as a state and even with the motion of Russians as a nation, which moved in this direction even before being decreed by the government. The prince’s acceptance of his fait opened up the road for his descendants. Humility as victory – this is what Alexander Nevsky teaches us. One doesn’t see one’s own victories, only getting abuse from one’s neighbors who happen to share one’s humiliation, who lack understanding and see only disgrace. One’s distant descendants, on the contrary, are almost incapable of seeing how their great legacy came about in the first place. In the given case, such long-term public veneration of the Right-Believing Prince Alexander is due to the Russian people’s instinct and faith that it did not endure the Tartar yoke and expand to the east all by itself, nor was it united with Siberia all by itself. Everything has its first cause and prime mover, its heroes and its saints.